The Satake Rotary Sifter has a long proven reliability, along with the accumulation of our continuous improvements. Our years of experience have resulted in many improvements and innovative features. The machine can sift milled rice efficiently and accurately into 2 to 7 classes: large broken, medium broken, small broken, tips, bran, etc. This model has 7 sieves, separating into 3 to 5 classes of rice. The machine is especially effective when there is a distinct difference in size, e.g. the separation of small brokens from rice bran. 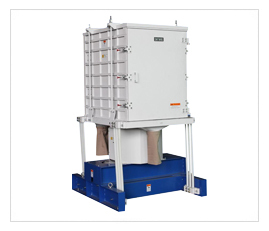 It can also be used for efficient size separation of wheat, beans and other products. Sturdy body construction and simple design ensure durability, as well as making assembly and maintenance extra easy. Accurate and Efficient Sifting: The horizontal circular movement gives rice grains active play in the spacious sieve area, resulting in efﬁcient and accurate sifting. Free-moving rubber cleaners prevent the mesh from clogging, which accelerates smooth passage of grains through sieves. Wide Choice of Sieve Combinations: 226 different mesh stainless steel sieves are available. Completely Sealed Sieve Frame: The sealed sieve frame prevents dust from escaping the machine, which ensures clean operation and improves plant sanitation.